Eurostar is to send the first of its 186mph Class 373 trains for scrap after just 22 years in service. The 18-car trains will be scrapped by European Metal Recycling (EMR) at Kingsbury. The first train was due to move to EMR’s Midlands site as RAIL went to press. Can these trains not be utilised somewhere else instead of scrapping them? Seems an awful waste.... Were some of these not in use at some stage in the ECML? These trains have a really bad transformer they could only operate at 110mph on the ecml and can't operate in netherlands or germany. What a Waste. Are these guys crazy! Why not fully refurbish them and then cascade them all to TGV for some of the long haul services. Or they can ship them all over to California for the new California High Speed line from San Diego and LA to San Francisco and Sacramento. they need high speed trains over there. I would imagine that refurbishment would have been considered, but it's probably not going to make economic sense to do so. 22 years of constant high-speed running is going to take its toll, and where other trains have been given a new lease of life by fitting new traction packages, they aren't subject to the same running environment. Very sad to see the Eurostar Class 373's that are going to be scrapped because of Eurostar could be ordering more new trains including more Class 374's E320's to replace the Class 373's. If only the Class 373's would of been given a new lease of life to be used on the ECML but that's not going to happen because of VTEC are ordering the Hitachi Class 800 and Class 801 IEP's. 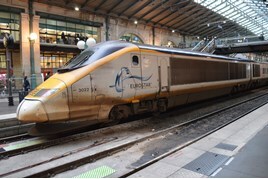 As a retired Eurostar Driver at first I too was very surprised to hear that these first generation marvellous trains are to be scrapped, but after chatting to one of our senior engineers it became obvious why they cannot easily be used elsewhere. These are the 20 car full length sets which were built to do a very specific job to very exacting standards. The shorter North of London sets which did for a time work on the ECML could only do that because of their shorter length. For the full length sets to operate on the same route would require substantial lengthening of platforms, depots and sidings. The NoL never were passed to work up to Newcastle because of signalling interference worries and so were confined to the Leeds route. If these redundant sets were to work anywhere else there is a huge amount of equipment built into the sets which is now starting to become life expired. The trains have both AC and DC power units which is very rare, they have multiple signalling equipment unique to the routes they worked on and this equipment is highly interlocked and not easy to separate. The articulated nature of the coaches means that individual coaches cannot be removed, operating fire doors between the coaches and the different automatic step heights for working with different height platforms in France, Belgium and ET all contribute to make these sets unique. They have travelled many millions of miles at the highest speeds and that takes it toll after 20 years. I too hate to see wasted resources but unfortunately in this case it seems they did their specific job admirably but would be too expensive and complicated to have their life extended for work elsewhere. I understand though that a number will be refurbished and continue to to the job they were built for. The first of these refurbished sets is back in service after a very long overall and proving popular. It is now working alongside the new Siemens Eurostar sets. Couldn't have written a better reply myself. They were designed specifically for their job but as bespoke units (smaller loading gauge and third rail only before HS1 was opened) they are becoming more and more expensive to maintain. 20 years is quite a healthy age for a high speed train. I really think that its time that Rail magazine changed to use metric. This international High Speed train at "186mph" is an especially egregious example. Why is Rail so far behind its competitors, when continental comparisons are so pertinent. Here we measure speed in mph which is why metric is not mentioned. HS1 fair enough, with French and Belgian drivers being used to kph and kilometres. Can't see the logic in the other 2 though. A bit of a waste isn't it? Why not refurbish and introduce new services across the continent or even as sleeper services? Would sleeper trains succeed ? The original Nightstar stock never entered service and instead was sold to the Canadians. The comments were more useful than the too short article! Are the eurostar at kingsbury yet? According to the railway magazine the first delivery was cancelled. Will the replacement class 374 (or e320) fit the platforms at Ashford? I agree. When I was a railwayman the units of measurements were miles and chains; the latter very appropriate since it was approximately the length of a coach length. I do not know of any good reason for copying continental habits. Will they sell off the name plates and memorabilia? Would like drivers seat for my office. What a waste! They could just refurbished all of them and make them run alongside the class 374's and increase the frequency of the trains! Wasteful.